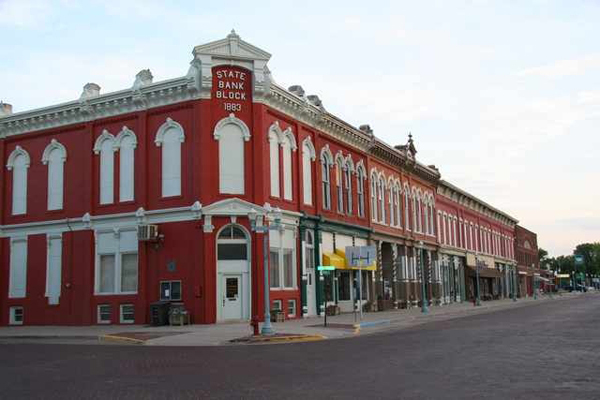 The Red Cloud Walking Tour is an extensive self-guided exploration of the many historic sites and locations related to the life and times of Willa Cather. Maps are available at the Willa Cather Foundation office or in front of the Red Cloud Opera House, should you arrive after hours. Brief information about each site is included. Please note that tours of the properties themselves are available during scheduled tours only, and only properties marked with an asterisk are owned and managed by the Nebraska State Historical Society and the Willa Cather Foundation; all others are privately owned, and we ask that visitors respect the privacy and property of the owners. 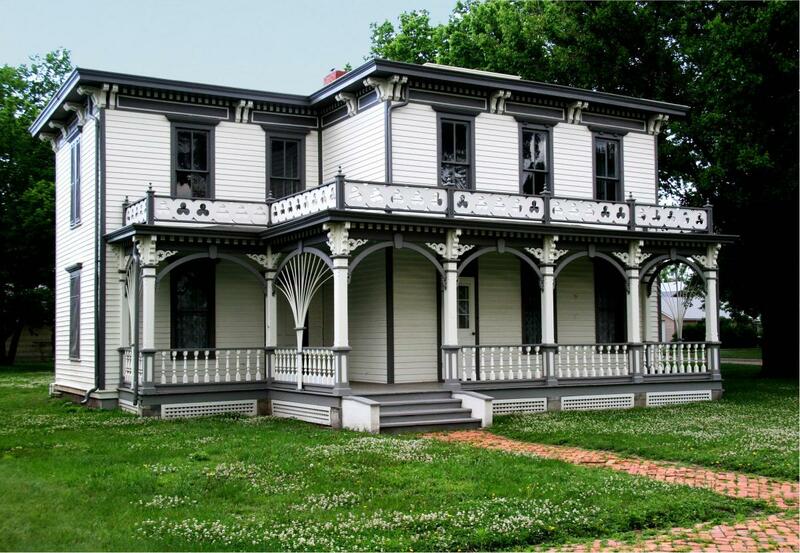 This lovely structure was built in 1885 and restored by the Willa Cather Foundation in 2003. 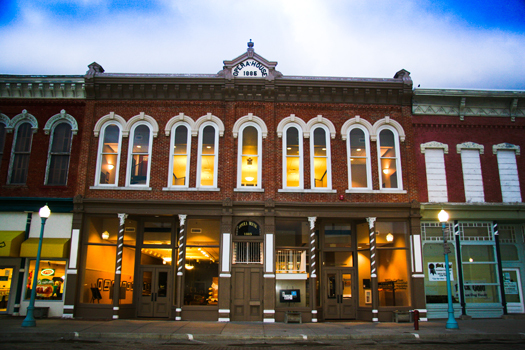 The first floor houses a bookstore, an art gallery, and the Foundation offices; upstairs you’ll find the Opera House with the original floors, support columns, and wood on the front of the stage. It is on this stage that William Jennings Bryan spoke, Blind Boone performed, and Willa Cather gave her graduation oration in 1890. Built in 1885-86 by Senator Moon of Michigan. It is called the Moon Block but appears in The Song of the Lark as the Duke Block; Red Cloud in turn becomes Moonstone. Across the street from the Opera House is the site of Dr. Cook’s drug store. (The second brick building from the corner of 4th and Webster.) When Willa Cather was in high school, she worked here, taking her pay in books and the wallpaper that still hangs in her childhood room. Made of Red Cloud brick in 1883, this is one of the first brick buildings in town. This building was erected in 1889 by Silas Garber, fourth governor of Nebraska and prototype of Captain Forrester in A Lost Lady. 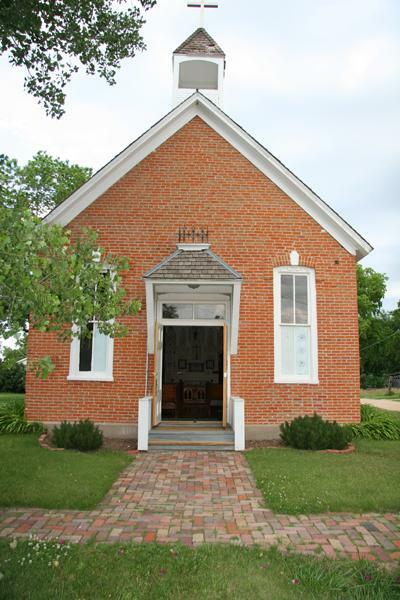 Restored by the Willa Cather Foundation, the bank displays the original Colorado sandstone frontage, along with native Red Cloud brick. The tiles framing the door are also original. A block south of the Farmers’ and Merchants’ Bank, on the corner of 3rd and Webster, you see the building erected by J.L. Miner (the prototype for Mr. Harling in My Antonia) in 1883 for his general store. Cather describes this building in “Two Friends” and mentions the high windows over the wooden sidewalk. Located on the second level, one bay north of the old Miner Store, you’ll see the site of Charles Cather’s real estate office, where Willa Cather also had her laboratory for dissecting animals. The Cather family lived in this home from 1884-1904. Willa Cather describes it in great detail in The Song of the Lark and “Old Mrs. Harris.” Willa Cather’s room was upstairs on the north. Visitors can see some of her original possessions still displayed there, as well as the family’s household items throughout the home. 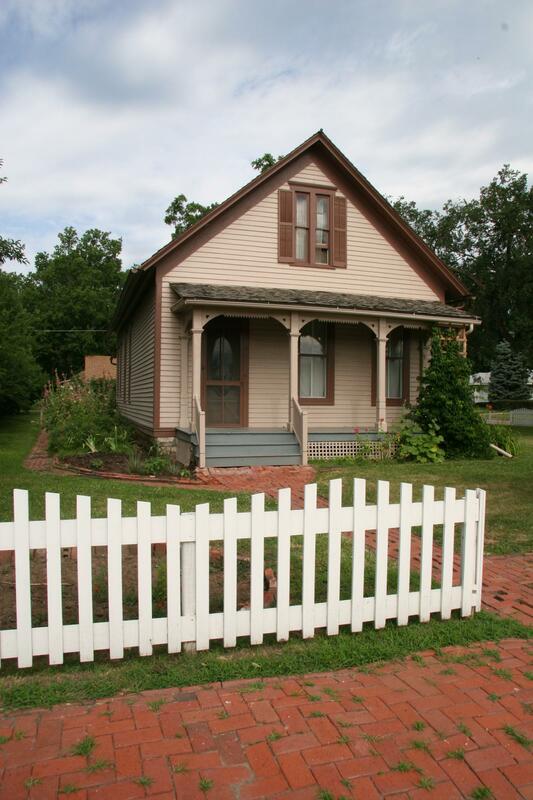 One block west of the Cather home, you’ll see what is known as the Harling House. This is the home described in My Àntonia, where Antonia worked. Annie Pavelka is the prototype for Antonia, and she lived here while working for the Miner family. This is where Cather befriended Annie, and would develop the strong relationship that inspired her most beloved novel. Look across the street to the east to find the white frame house where Mr. and Mrs. Weiner lived. They are the prototypes for Mr. and Mrs. Rosen in “Old Mrs. Harris.” Mrs. Weiner’s kitchen overlooked the Cathers’ backyard. At the corner of Third and Seward is the site of William R. Jackson’s (Uncle Billy Beemer’s) cottonwood grove. It is mentioned in The Song of the Lark. Also along Seward Street ran the horse drawn street car that went past the Cather house and on to the hotels in downtown Red Cloud. 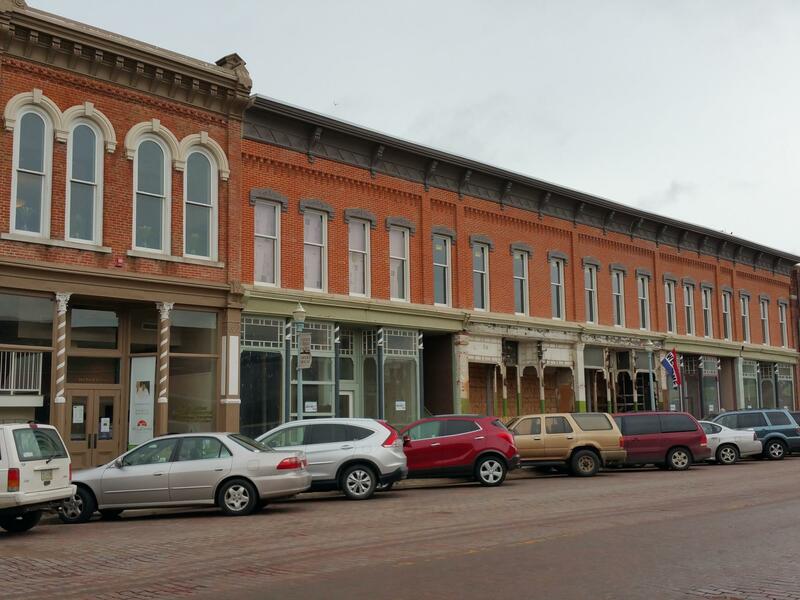 Division Street is a physical reminder of class difference in Red Cloud. Those citizens who lived south of Division were economically challenged. As you pass this street, you’ll see the boardwalk staircases on the way to the Depot. Cather uses the depot in many of her works, such as in an early scene in My Antonia. 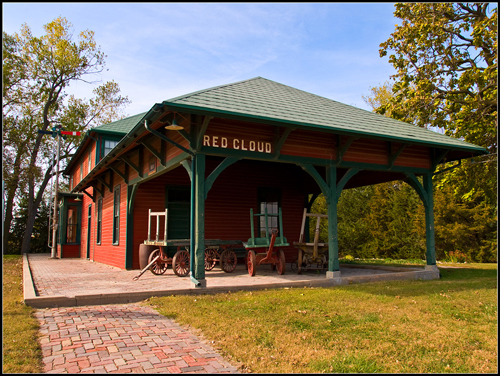 The Depot also figures prominently in “The Sculptor’s Funeral.” This is Red Cloud’s third depot, built in 1897. Willa Cather would have used it when traveling to and from her childhood town. This is the site where Annie Pavelka’s first child was baptized and where she was married. 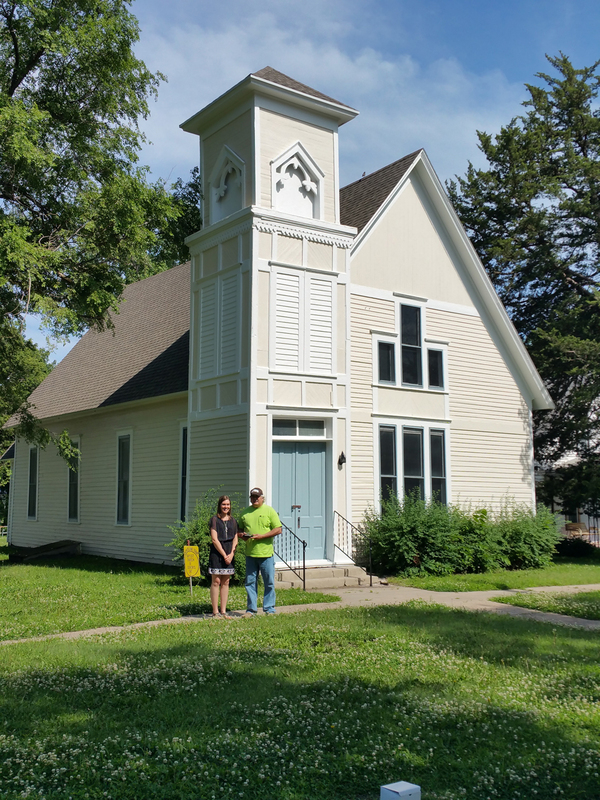 Note that it is south of Division Street, and the parishioners’ lack of money meant no bell in the belfry, “poor man’s stained glass” (lead paint with hand-made designs), and no priest. There was a special whistle to alert worshipers of Mass when the priest was aboard the train. 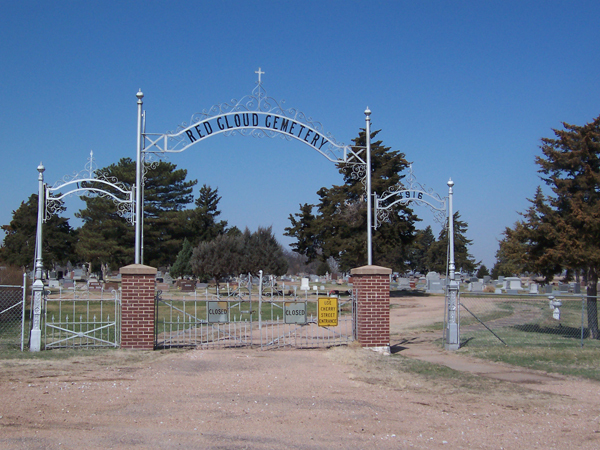 Around 1905, the town leaders decided to move the graveyard to Red Cloud. Here you’ll see the graves of Silas Garber; members of the Sadilek family, including Frank Sadilek, whose son Anton brought his body here from the crossroads burial place; and Mr. and Mrs. Cather (Cather’s parents), and Grandmother Boak. Also in the family plot is the grave of Marjorie Anderson, the girl who came with the Cathers from Virginia; she was the prototype for Mandy of “Old Mrs. Harris,” Marty of “Poor Marty,” and Mahailey of One of Ours. Here you’ll see a large cottonwood grove. This is the setting for A Lost Lady. On this hill in 1870 the first settlers built their stockade. Later Silas Garber (Captain Forrester) built his home here. This is the church of Willa Cather’s youth. She was raised Baptist, but later joined the Episcopalian church. 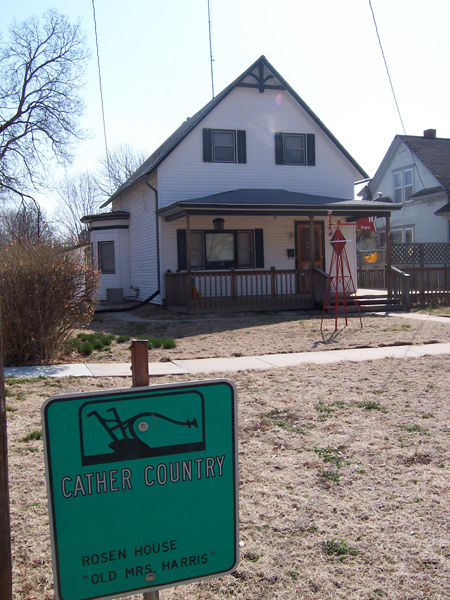 At the corner of Sixth and Seward stands the Cather family’s second home. They lived here from 1904 until the death of Cather’s parents (father in 1928, mother in 1931). Willa Cather's parents purchased this home in 1903 and left their little rented home at Third and Cedar where Willa had spent her formative years. She was 30 at the time. Over the next 28 years, Willa often visited her family in this house during summers and occasionally for Christmas. It has been reported that she used to put up a tent-like awning on the upper front porch and spent a great deal of time there. Cather's last visit to Red Cloud was for a family reunion at Christmas in 1931. She described this house as the Ferguesson family home in one of her short stories, "The Best Years," in her book, Five Stories. Across from the second Cather home is the Methodist Church of which Cather writes in My Antonia. She tells how starved the children were for color and how they stood in the cold and looked at the stained glass windows. This is the building described in the scene of trials of German immigrants in One of Ours. This section of town is where the more affluent families were building newer, better homes. In Lucy Gayheart Cather speaks of Quality Street. Cather likely chose the expression because a German woman, Mrs. Newhouse, called that section of town Quality Knob. On this corner stands the home of M.R. Bentley, prototype for Wick Cutter in My Antonia. Cather mentions the Cedar trees that Mrs. Cutter felt afforded her privacy and that her husband was always threatening to cut down. This is the site of the home of Willa Cather’s grandparents, the Burdens of My Antonia. Although the original house is gone, the trees remain. Cather mentions that Jim Burden watched the line of the river hills. Because there were no trees in Red Cloud at the time, it was possible to see the river hills. You can approximate the view without trees by standing in the center of Cherry Street and looking south. This large white house belonged to Will Ducker, the scholarly Englishman who taught Willa Cather Latin and Greek. This is the home of the prototype for Dr. Archie in The Song of the Lark. Behind the house was the strawberry bed where Thea went to pick strawberries. Willa Cather joined the Episcopal Church in 1922 at the age of 50. On the north wall are two painted stained glass windows dedicated to her parents. She chose the window of the Good Shepherd for her father because he raised sheep in Virginia. The Cather family was devoted to this church; the walnut altar rail was given in memory of Douglas Cather. 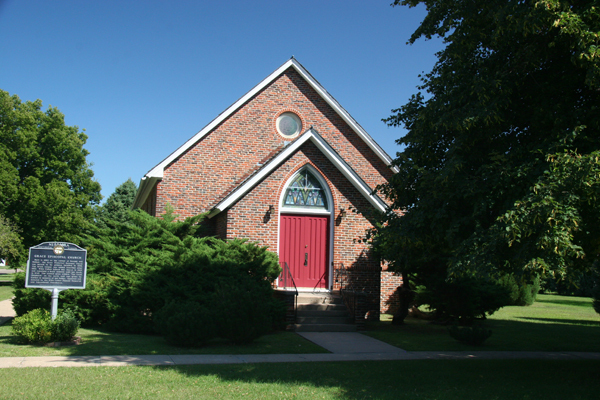 The church held memorial services for Willa Cather in 1947.